By H. D. Catlin, 1893. The playing cards are of Egyptian origin and an ingenious human device, derived from the divine origin of time. The time is indefinite when Egyptian hieroglyphics were first carved on stone, representing four numbers: the No. 4, No. 12, No. 13, No. 52; in recognition of their Egyptian annual calendar of time. The number "four" representing the four seasons of the year—spring, summer, autumn, winter. The number "twelve" representing the twelve months of the year, January to December, inclusive. The number "thirteen" representing the thirteen weeks in each of the four seasons; and the number "fifty-two" representing the fifty-two weeks composing the full year. The playing cards represent the same identical four numbers, by the "four suits" of the pack, the "twelve face cards" of the pack, the "thirteen cards" in each of the "four suits," and the "fifty-two cards" composing the full pack. It was in an early part of the twelfth century when Egyptians were first attracted by the same "four numbers," and with their native love for games, sports and amusements, sought to gratify their eager desires and bring them into use as the origin of future pastime recreations and social enjoyment. The ambition to gratify their desire continued and repeated itself through ten succeeding generations without success. A like ambitious desire was subsequently manifested by later Egyptians, who struggled with the same four numbers, and for the same gratification of their native love for sports and amusements as a pastime enjoyment. They labored long and perseveringly, beginning with the number 52 as of first importance. They were not long in recognizing a like importance of the number 13 in sequence order. After giving due and proper place to the number 4 in recognition of the four suits required, and by applying the two red suits in recognition of spring and summer and the two black suits in recognition of autumn and winter, they could thus represent, in due and proper contrast, the four seasons of the year. They could now have formulated and played their game in sequence order, by leaving out of use the number 12, and thus to break the complete chain of numbers required to make perfect their "annual calendar of time," in recognition of its divine origin, knowing full well that such omission could never be accepted as a popular and ingenious human device, consistent with the original undertaking of their boasted enterprise. This embarrassment continued long, fatiguing and discouraging to their ambitious enterprise, which, in the past, has ever been the experience of man in many of the progressive enterprises of human genius which now contribute so largely to the growth of greater facilities for a larger volume and better economy in many of the departments of business. Their new and original game could not be made durable and popular without the favorable recognition, sanction and acceptance of their honored "king and queen." With this important end in view they counseled together, long and patient, without success, until one of their number broke the spell. "I have it." And when explained, they mutually decided to add to each of the four suits the figure-heads of the "King and Queen," and the king's "page" in armor, with helmet, shield and spear, later known to euchre as the "Knave" and now as the "Jack," thus bringing into use the much needed number 12, required to complete and make perfect their game, by making the four "Aces," alike in each of the four suits, the highest commanding card. With this completion, thus perfected, the players practiced long, making perfect their skill in the art and scientific use of their game. 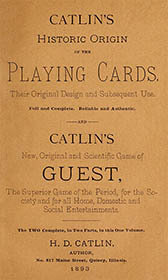 With such complete and perfected practice of their game, the four players made personal application and asked permission to play their game on the floor of the "king's court," for the edification, amusement and enjoyment of their honored king and queen. They were granted the audience they had asked, and played their first initial game—as yet without name—in the early part of the sixteenth century; so still and silent, with no word spoken above the sound of a still small voice, until the full close of the play, when the king pronounced the name "Whist," (a silent "whist of the wind,") which has endured without change until the present time and will ever so continue. So elated with the game, so amused, gratified and entertained were the crowned heads of the king's court that the players were presented with a pecuniary compensation, equal to $1,000 of our money. The game of Euchre is of German origin, and was introduced to overcome the long, tedious and fatiguing game of Whist, and bring into use a much shorter, more jolly and more social game. The French copied from the Germans, and brought into use the same identical game under their French name of "Ecarte." The French are known to have introduced their game of "Ecarte" into the United States in the early settlement of New Orleans and the gulf coast of the present state of Louisiana. During the Crimean war French soldiers, when held intrenched, as a reserve, and a present safe keeping for future service, amused themselves by playing "Ecarte." The game of Whist has been in use nearly four hundred years. The game of Euchre has been in use nearly one hundred years. Moral: The question of use and abuse? is one man must meet; the solution of and the answer to which man must be individually responsible. There is nothing from the hand of the Creator which man may make so great, so good, so wise and profitable use as time. And there is nothing from the same divine source which man may make so little, so evil, so unwise and unprofitable use as time. There is nothing from the hand of man which may be made to contribute so much of good, wise and moral social enjoyment as the playing cards; and there is nothing from the same human source which may be made to contribute so much of evil, unwise and immoral social estrangement as the playing cards. The question of good and evil is one which man must decide and establish as the basis of his individual character. Of the two contending forces in man, the final question is, "Which of the twain shall I release unto myself, and which shall I crucify? If I release the good and crucify the evil, then am I good. If I release the evil and crucify the good, then am I evil." Consider well. Consider, and elevate the moral standard of human character in the mind and life of the individual man. No. 817 Maine Street, Quincy, Illinois. "Oh, time, why thus abused? And thou cards, why so misused? To guide man's thought to Heaven."